This page on ISI vs ICI mentions difference between ISI and ICI interference types. The ISI and ICI are the short forms of Inter Symbol Interference and Inter Carrier Interference respectively. As we know when the radio frequency(RF) signal consisting of electro-magnetic waves are transmitted through the air, it will be interfered by other RF signals transmitted from nearby cellular towers. The RF interference are mainly of two types viz. adjacent channel interference and co-channel interference. Refer RF interference types for more detail. There are two types of transmission methods to transmit the baseband information viz. Single Carrier(SC) and multiple carriers (based on OFDM). Refer SC Vs OFDM for more information. In single carrier, 1 bit is carried by 1 carrier waveform. In OFDM, multiple bits are transmitted in 1 symbol (over multiple carriers). 1 symbol means group of multiple carriers in frequency domain. Above mentioned interference types viz. adjacent channel interference and co-channel interference are caused in single carrier based systems. ISI and ICI are caused in OFDM based systems. In OFDM based systems, the transmission takes place symbol by symbol. Before the symbol transmission, symbols are packed with complex modulated data symbols. For example, in WLAN 802.11a based system, one symbol is composed of 64 point FFT. Hence assuming modulation type as QPSK, each carrier in the group of 64 carriers will be mapped with two bits of data information. After the symbol is formed, CP (Cyclic Prefix) is appended to each of the OFDM symbols individually. CP is the last part of OFDM symbols. It can be either 1/4, 1/8, 1/16 or 1/32 the part of one OFDM symbol. For CP of 1/4, there are 64 samples in a CP which are appended. As the symbols travel one by one to the other end, the path from transmit to receive end will introduce delay spread in time domain. 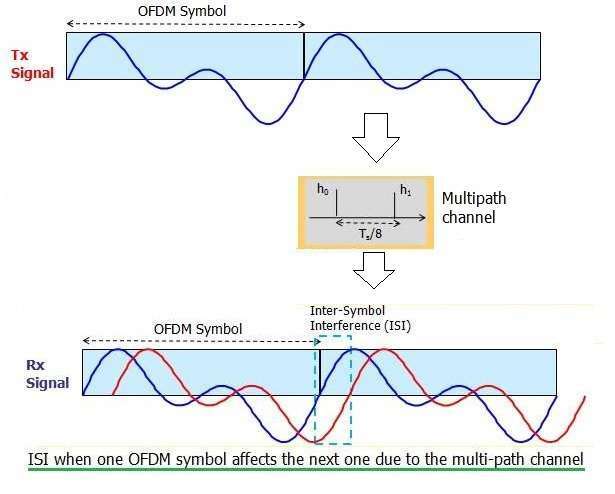 This results into OFDM symbol getting spread out and hence will interfere with consecutive OFDM symbols. This is referred as ISI (Inter Symbol Interference). ISI interference can be mitigated or reduced using CP (Cyclic prefix) concepts explained above. Here CP length is choosen as more than channel delay spread. Figure-1 depicts ISI results of one OFDM symbol affecting consecutive symbol. The same ISI has been eliminated as shown in figure-2. 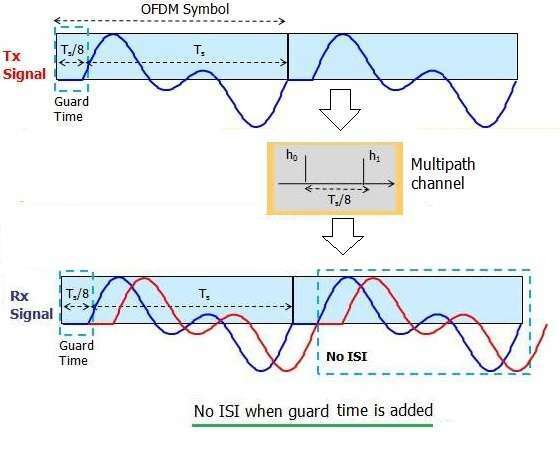 This is due to addition of guard interval between neighboring OFDM symbols. 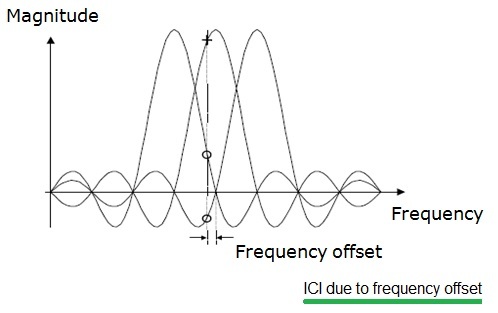 However each OFDM symbol suffers from inter carrier interference (ICI) as explained below when guard interval is added. Cyclic Prefix(CP) eliminates ICI. The disadvantages of both CP and guard time period method is reduction in bit rate of the system due to addition of redundancy. The difference between CP and guard time is that in CP last part of useful symbol period is appended at the start while in guard time unused samples are added in between. As we know, in OFDM carriers are densely packed, where in peak of one sub-carrier is at null of other sub-carriers. This is referred as orthogonality. In other words, for OFDM to be efficient modulation, subcarriers should be orthogonal to each other. ICI (Inter Carrier Interference) is caused when sub-carriers lose orthogonality. ICI is result of following two reasons. • Frequency offset at the receiver. ICI is reduced or can be mitigated by estimation of frequency offset and correction of sub-carrier spacing accordingly.